Andres Marquez, technical manager of the Energy Smart Data Center at Pacific Northwest National Laboratory, was one of the expert panelists featured in a webinar on energy efficiency in a session titled "Pumping Up Power Efficiency." 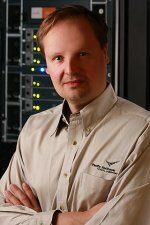 The June 18 webinar was sponsored by Scientific Computing magazine and focused on the increasing need for energy efficient high performance computing systems. Today's researchers and engineers demand more efficient computing platforms that make better use of the energy used without sacrificing the processing speed they require to be competitive. New data center technologies will reduce power consumption per resource used and will improve power provisioning and thermal management by novel metrics and monitoring capabilities. Pumping Up Power Efficiency is now available "on demand" from either http://www.advantagebusinessmedia.com/ims/SC/energy/default.htm or http://www.scientificcomputing.com/webcast-Pumping-Up-Power-Efficiency-060209.aspx. You will be asked to register.